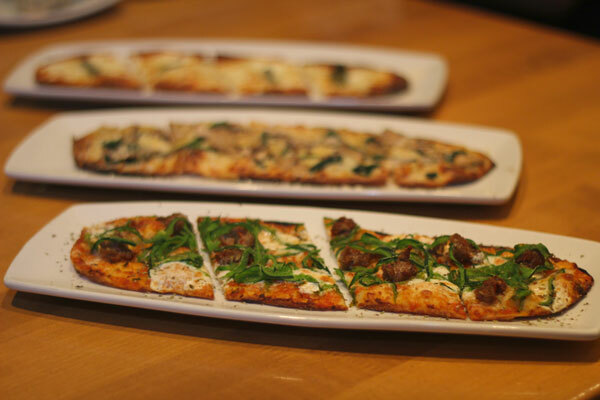 California Pizza Kitchen has introduced a line of appetizer sized pizzas called California Flatbreads as permanent additions to its menu, priced at an average $5.95 each. The Bianco is a white pizza topped with whipped truffle cream, Gorgonzola cheese, mozzarella cheese and fresh sage. The Shaved Mushroom + Spinach is topped with cremini mushrooms, sautéed spinach, California olive oil and Romano and Parmesan cheeses. The Spicy Fennel Sausage + Poblano is made with sausage, fresh mozzarella, fire-roasted chiles, Greek oregano and spicy marinara sauce.